Startle trick or treaters and costume party guests when this old crone jumps out to get you! Something wicked this way comes, and her name is the Lunging Haggard Witch. With several spooky sayings, one must be careful not to get in the way of this powerful witch! Standing over 6-ft (180cm) tall to the top of her pointed hat, this wicked wiccan crone features a soft PVC head with glowing LED light-up eyes, long stringy gray hair, an easy-to-assemble quick-connect metal frame, gnarled plastic hands and plastic staff with rotting skull topper. She is dressed in a black and gray fabric hooded costume cloak with shredded-gauze shroud details. -‘’Excuse me, can you help a sweet old lady find her cauldron? I can’t seem to find it anywhere. I GOT YA!! Ooh, he he he! Oh, if you weren’t so fast, YOU’d be in my cauldron right now!’’. Infra-red motion activated sensor works up to 6.5-feet (195cm) away and works in all lighting conditions - bright light to no light! Item includes volume control. Assembly required. Materials: 40% Iron, 8% PVC, 2% Electronic, 30% Polyester, 20% Cotton. 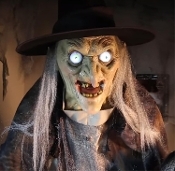 Deluxe Scary Standing Animated Talking Crone-LIFE SIZE WICKED LUNGING HAGGARD WITCH-Glowing Eyes Spooky Sound Effects Animatronics Creepy Halloween Haunted House Horror Prop Decoration JUMPS OUT! ***Please Note: Products are designed and rated for use in the United States using 120 volt current. With or without a transformer, this product is not recommended for use outside the US.